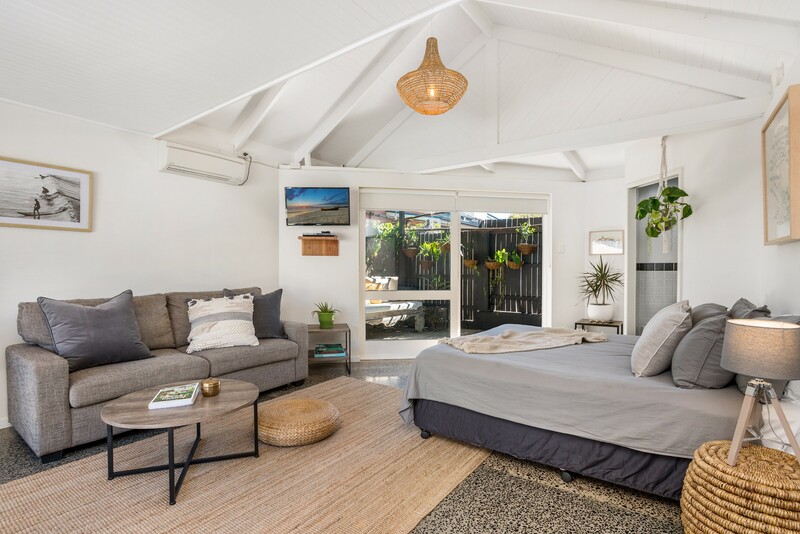 Realise your Byron Bay holiday dreams at 3 Little Pigs - a large and lovely timber holiday home which accommodates up to 11 in 4 spacious bedrooms, 2.5 bathrooms and a separate studio space (with ensuite). 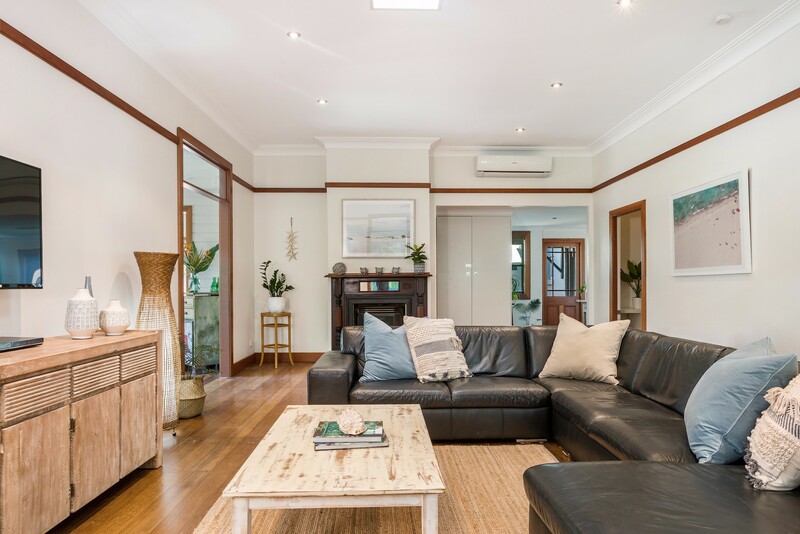 Open and light-filled, the home boasts high set and raked ceilings, original sash windows and simple beach inspired theming throughout. 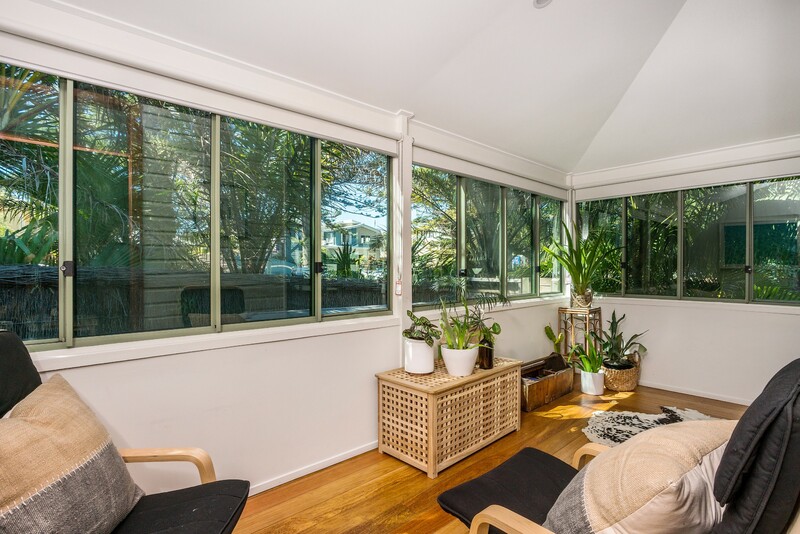 Stay in summer and enjoy breezy reading on the outdoor daybed and sun soaked BBQ’s on the large courtyard - or stay in winter and cosy up by the gorgeous gas fireplace. 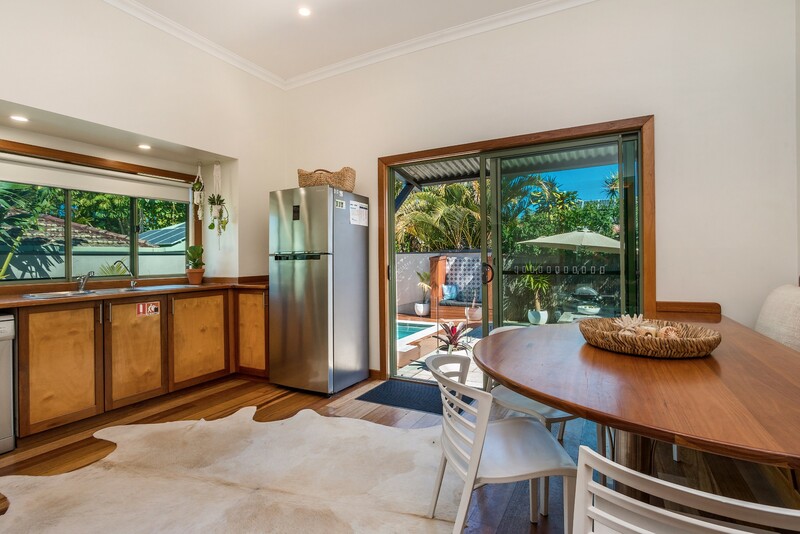 The excellent central location delivers Byron Bay town in a short 2 minute stroll and world-famous Main Beach in less than 5 minutes. 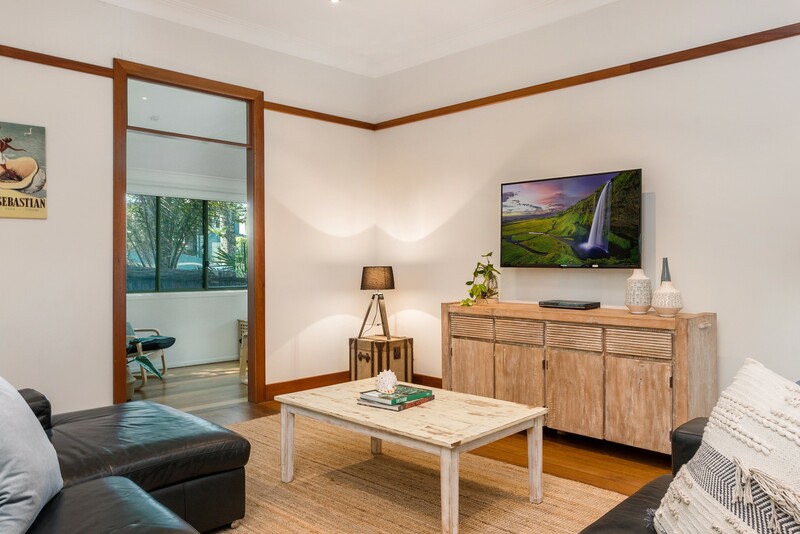 A large, open plan living space features polished timber floors, whitewashed beach-inspired furniture and a huge modular lounge that promises to fit all the family. 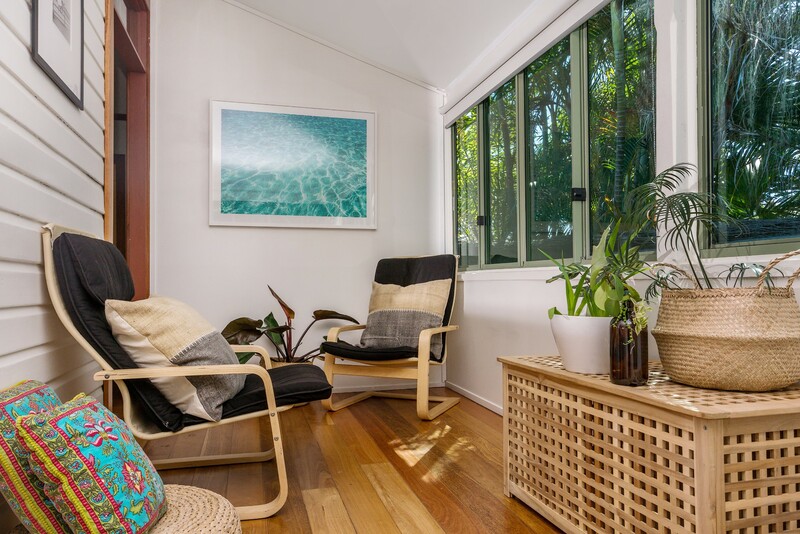 Cosy up in winter and stay cool in summer with reverse cycle air conditioning. 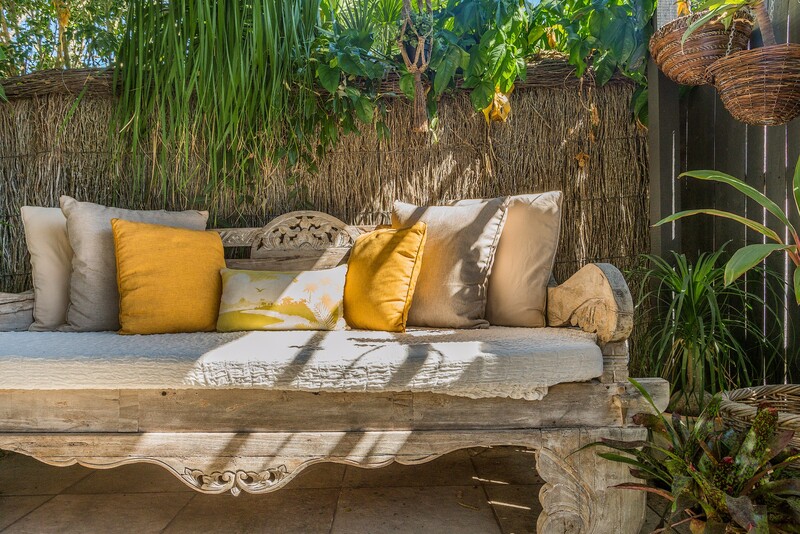 Share meals in casual, sunny style in the 3 Little Pigs dining space - wall to wall wraparound windows flood the room with light and a beach inspired table with bench seats transports guests beachside. 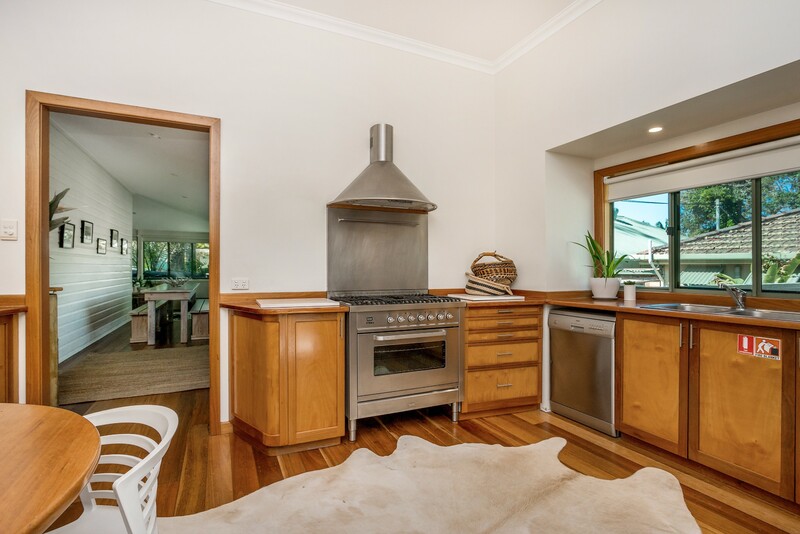 The large, open, light-filled kitchen includes electric oven, rangehood, gas cooktop and large stainless steel refrigerator. Share, easy casual meals at the large round table, just off the kitchen. A sliding door from the kitchen opens to the outdoor courtyard, for ease of entertaining and outdoor dining. 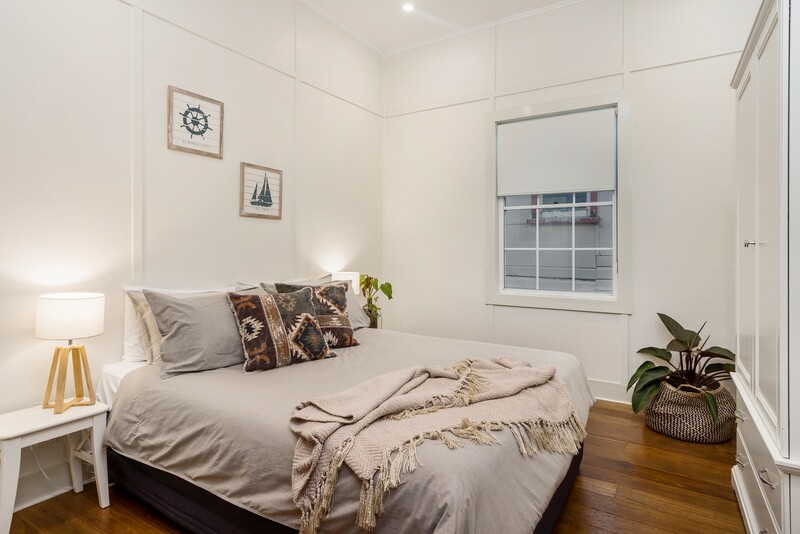 The sleeping space accommodates 11 and showcases easy, simple styling, with light and bright bedrooms and sash windows with streams of natural light. 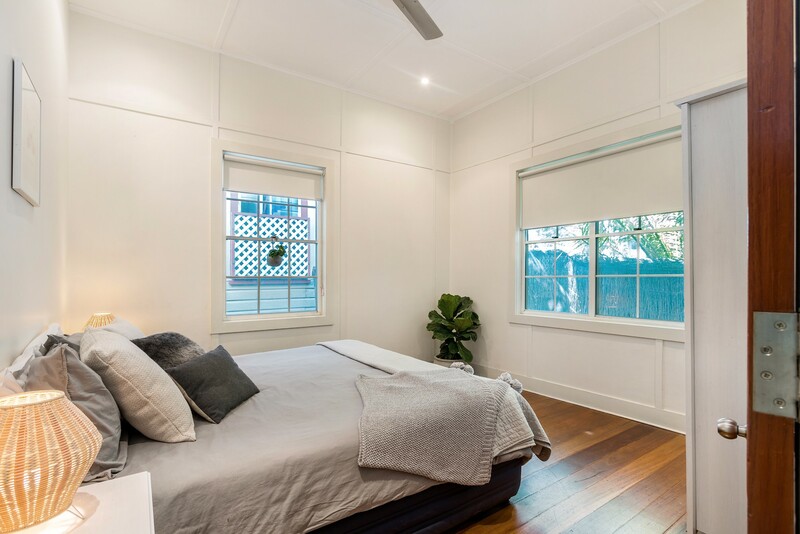 The main house includes a guest bathroom with large shower and bath, plus an additional shower and basin in a 2nd bathroom and a separate guest toilet. 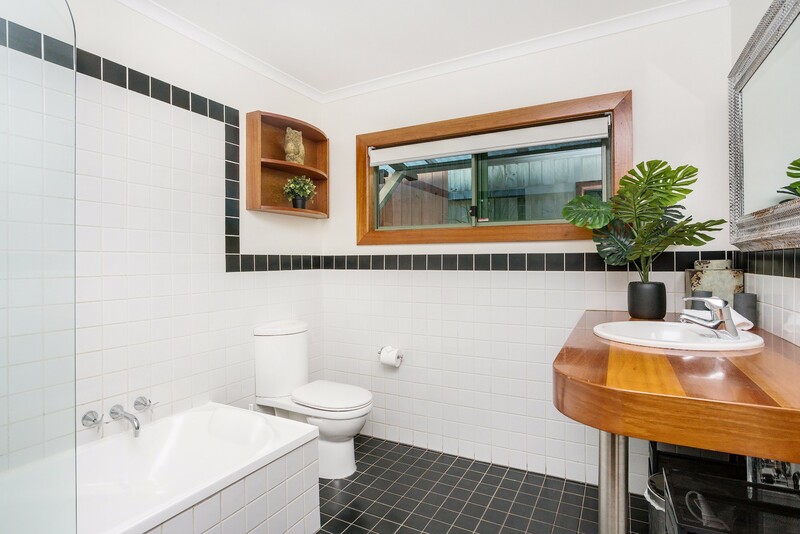 The studio comes complete with an ensuite bathroom, including shower and toilet. 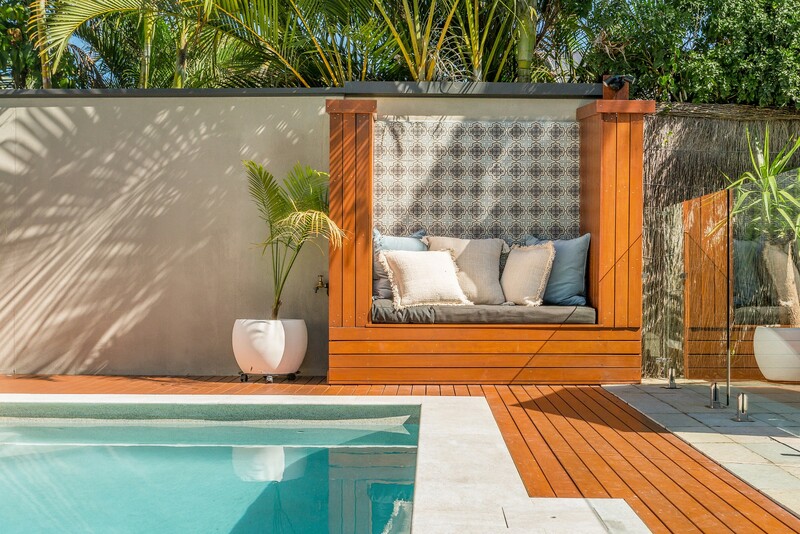 Relax with a book by the heated lagoon style pool. 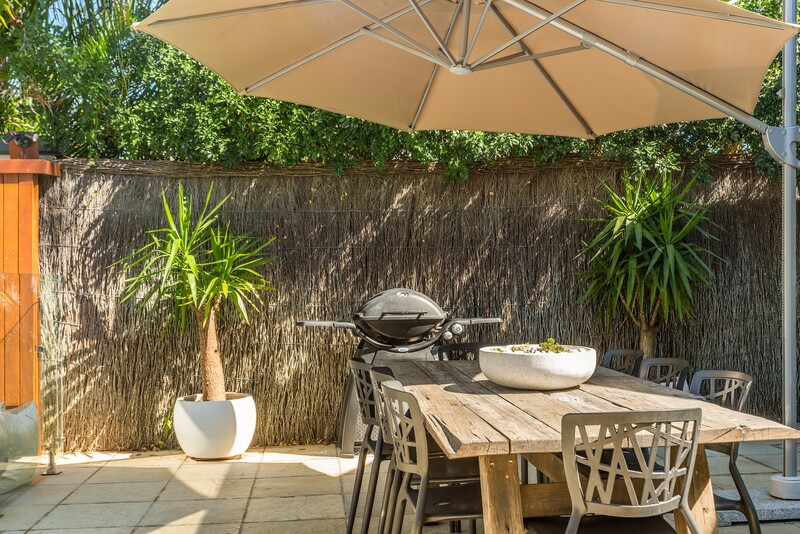 An elevated sun soaked courtyard area with a huge outdoor dining setting, cantilever umbrella and large BBQ conjures images of sunny shared lunches and balmy evening BBQ’s. 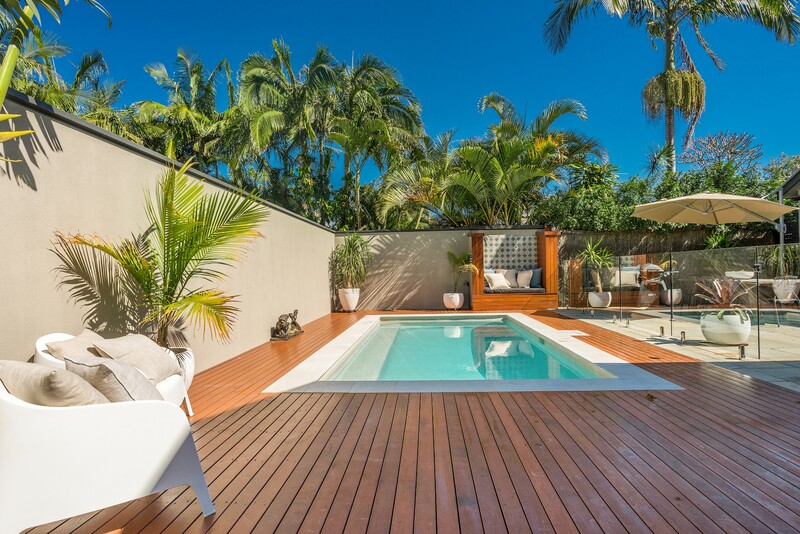 The fully fenced property allows pets and brush fencing offers added privacy. 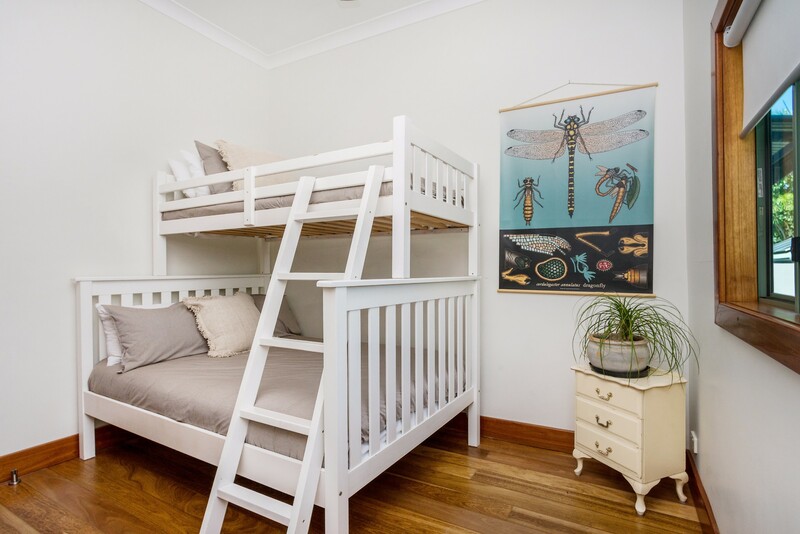 3 Little Pigs is perfectly positioned in Byron Bay’s central Shirley Street, a short 2 minute stroll to the busy and bustling centre of town. Wander a little further through town and access popular Main Beach - perfect for families, kids and beginner surfers. 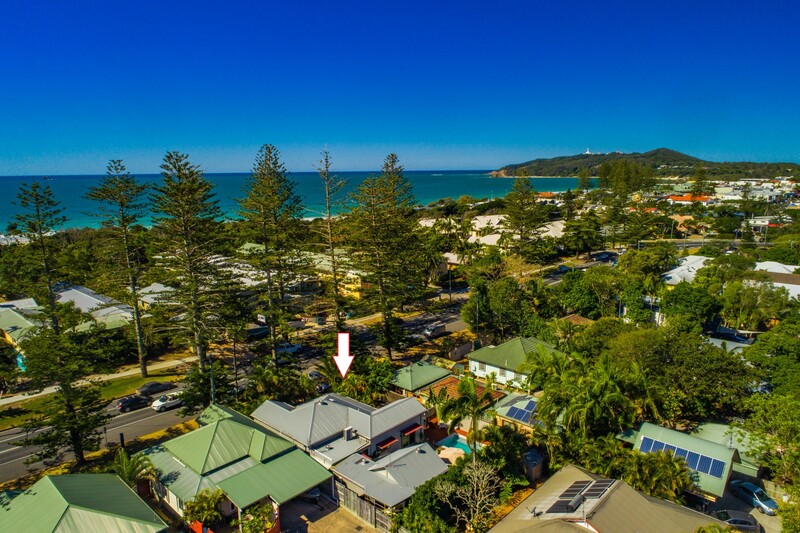 From 3 Little Pigs handy location, access all of Byron Bay’s beaches, shopping precincts, local markets and more within minutes. 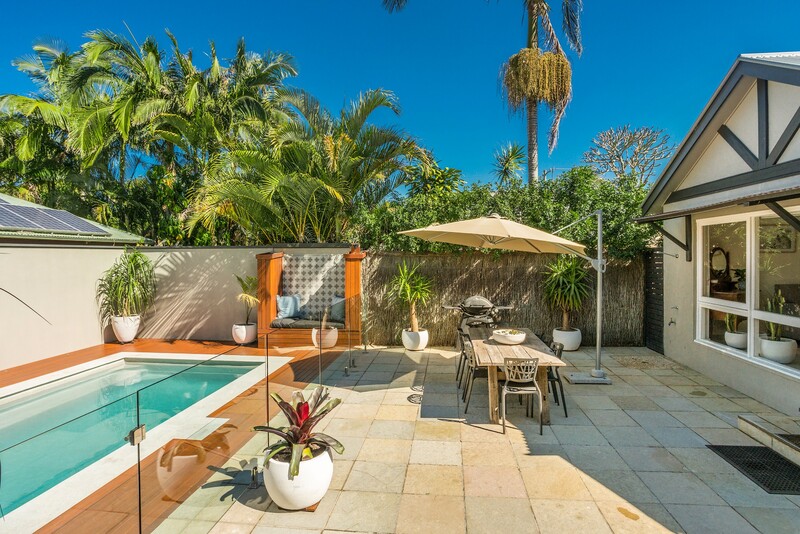 4 large bedrooms and the addition of a separate studio, as well as 2 dining spaces and large outdoor areas makes this holiday home ideal for extended or multiple family groups. 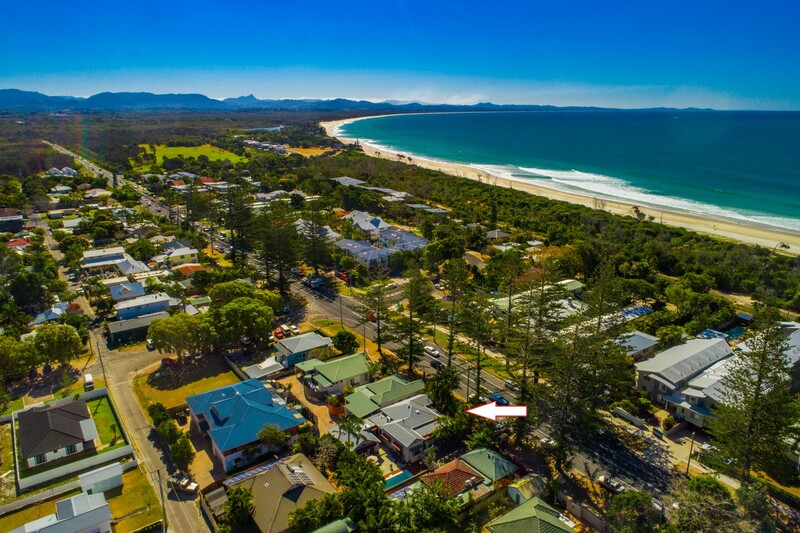 It’s close proximity to Byron Bay town and beaches promises a world of opportunity to meet the holiday needs of all ages. we had such a wonderful time, the house was amazing and so close to town. The whole house was amazing. 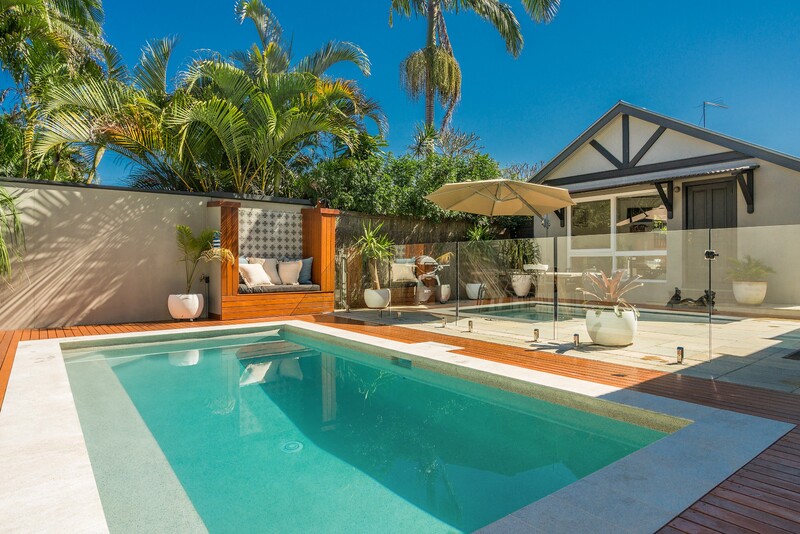 With the addition of the pool this place has everything you ever need and its a very close walk to town and the beach. 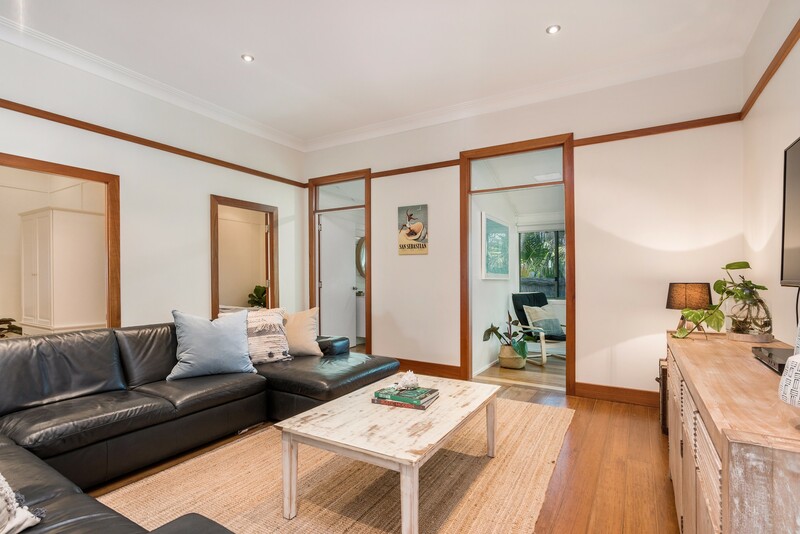 Great and amentities, as the space to accommodate everyone. I will definitely be booking again!